At what age can my child be skin tested? It is a common misconception that children need to be a certain age before they can be skin tested. Generally speaking, skin testing can be performed even in infancy, and as young as one month of age. However, the skin of very young children may not be as reactive as older children and adults, and therefore the results need to be interpreted more carefully. The reason for skin testing is probably more important than the age at which a child is tested. In infants and toddlers, allergic disease most commonly occurs as food allergy and atopic dermatitis. In school-age children, allergic disease occurs more commonly as allergic rhinitis. Asthma can occur at any age, but occurs most commonly in adolescent boys and teenage girls. Because of this, skin testing should be aimed at identifying allergic triggers appropriate to the age of the child. Skin testing, particularly prick skin testing, is virtually painless. There is no bleeding involved, as the needle only pricks the skin to the depth of a scratch. The worst part of skin testing is that the skin test sites may be quite itchy when positive results occur. Ask the nurse or doctor if the skin tests can be performed on the arm, rather than the back. A lot of the fear of skin testing comes from the child being held down. If skin testing does need to be performed on the back, a child may be less frightened if she can sit on a parent's lap, facing the parent with her legs straddled to the sides. 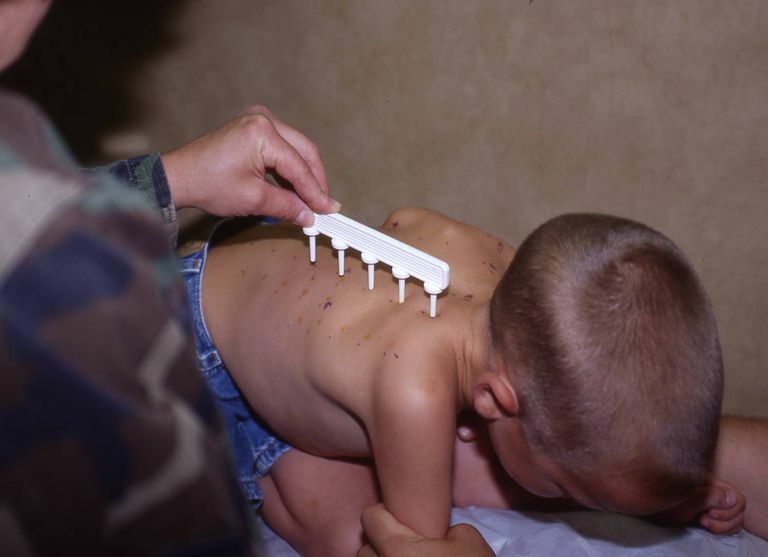 The parent then "bear hugs" the child so that the child does not move when the skin testing is performed. Ask the nurse or doctor if they have a multi-headed skin test device. This type of device delivers multiple skin tests with one quick poke instead of numerous, single pricks. The small amount of discomfort is worth knowing what your child is allergic to, and skin testing is certainly far less traumatic than having a large amount of blood drawn for RAST allergy testing. Food Allergy Practice Parameter. Ann Allergy Asthma Immunol. 2006;96:S1-68. Atopic Dermatitis Practice Parameter. Ann Allergy Asthma Immunol. 2004;93:S1-S21. Practice Parameters for Allergy Diagnostic Testing. Ann Allergy Asthma Immunol. 1995; 75(6): 543-625. How Are Horse Allergies Treated? Could You Be Allergic to Simply the Smell of a Food?